Any excuse is a good excuse for butternut squash (doughnut, $1.50). Rockville's recipe uses the farm's own eggs, too. Simplicity itself: a steak-tip grinder ($11.95) with mushrooms and onions. The "classic" ($7.99), roast beef teamed up with bacon, lettuce, and tomato, American and mayo, doesn't rely on bulk. It's less of a slugger than a line-drive hitter, perfect for a quick lunch. Why is Red's signature menu item often called a lobster "roll"? Why the quote marks? Not because of the shape of the roll itself — the squared-off, split-top bun, buttered and toasted, is the Maine standard — but perhaps because, from above, you can't see the roll for all the meat. Each serving (market price, about $17) accounts for more than one whole lobster, including the chewier tail meat as well as the sweeter claws and knuckles. Take a bite end-on, and odds are good that some of the meat will plop down into your butter with a messy splash. Inevitably you'll use your fingers to dunk loose bits of lobster; better sooner than later. Crab melt (about $13.50) on focaccia; umami supplied by bacon, tomato, and havarti. 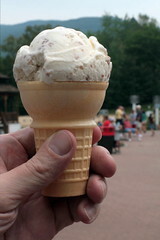 Gifford's brand grapenut ice cream ($1.75). Love those little crunchy bits. 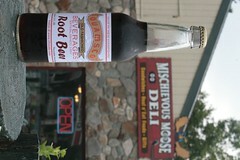 Squamscot brand root beer (12 fl. oz. ; $1.25) had little character: a little thin, a little too sweet. The house brand lemonade (12 fl. oz. 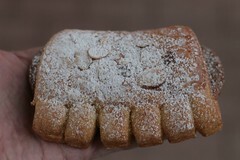 bottle; about $1.50) was passable; so was this "bear claw" ($1.75). The number of claws seems to be a matter for the baker's personal preference. This outpost for "Hungarian lunches and dinners" was quite empty early in the afternoon, and the dim interior didn't beckon me to sit down all by my lonesome. 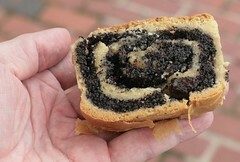 To go, I tried a poppyseed roll ($1.25) sweetened with golden raisins, and probably honey. 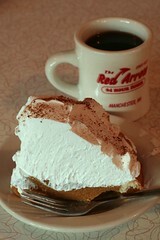 OK.
Small old-school diner with a belly-filling family touch. I followed my meat loaf hash browns with scrambled eggs and rye toast (special; $7.50) with this tall fat slice of pumpkin cream pie ($2.75), then took a long, slow walk.